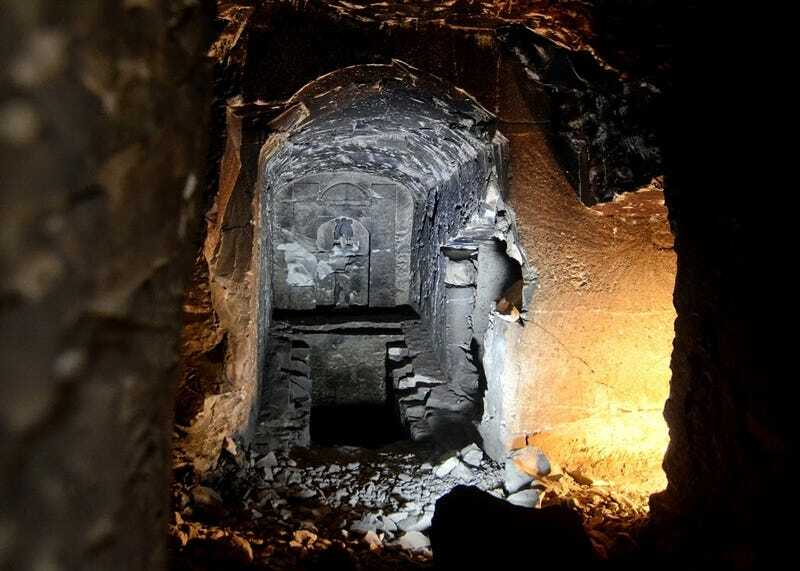 Archeologists have discovered an ancient tomb modeled after the mythical Tomb of Osiris as described by Egyptian lore in the necropolis of Sheikh Abd el-Qurna, on the West Bank at Thebes. The complex includes a shaft that connects to multiple chambers, including one with demons holding knives. The funerary room with the reliefs of demons holding knives is located west of the central chapel (on the left in the picture above.) It's connected to a 23-foot (7-meter) shaft right in front to another empty room. At the bottom of the same shaft there are two rooms full of debris. It's a unique tomb in the Necropolis of Thebes because it embodies all the features of the mythological Tomb of Osiris. The entrance of the main structure of the tomb. Included for reference, from left to right: Osiris, Anubis—protector of graves—and Horus—god of the sun, war and protection.